A blog about Cajun & Zydeco music and dance, as played and danced in Michigan; and now, with other topics, too. 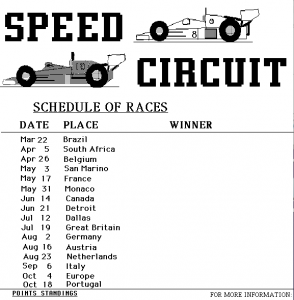 I was first exposed to the Avalon Hill version of Speed Circuit in the late 1970s, at a Metro Detroit Gamers MichiCon game convention. Someone (I can’t remember who) had made a very large scale track and used 1:64 scale cars. There were a number of us playing that game that day, but I don’t remember anything else about that race. 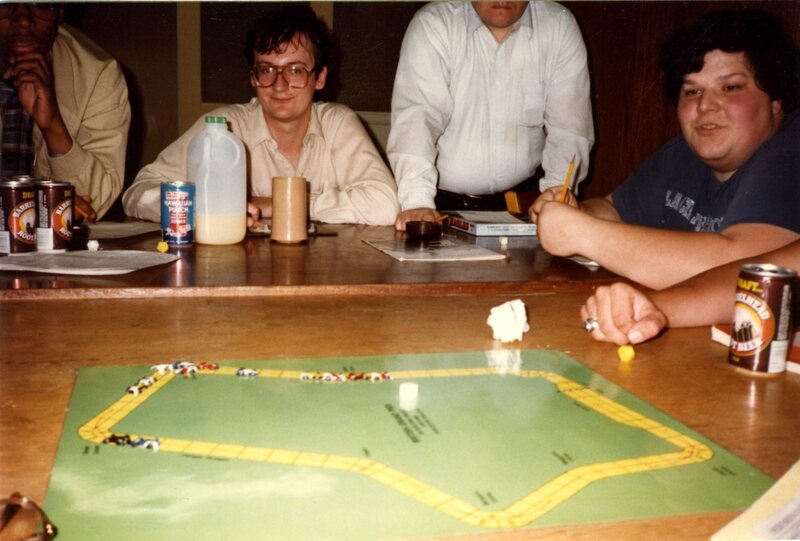 Speed Circuit played on a hand-made large-scale track at MichiCon, circa 1978. I then bought the Avalon Hill version of Speed Circuit, but couldn’t find any other folks to play it with. It seems none of my gaming friends were interested in auto racing games. 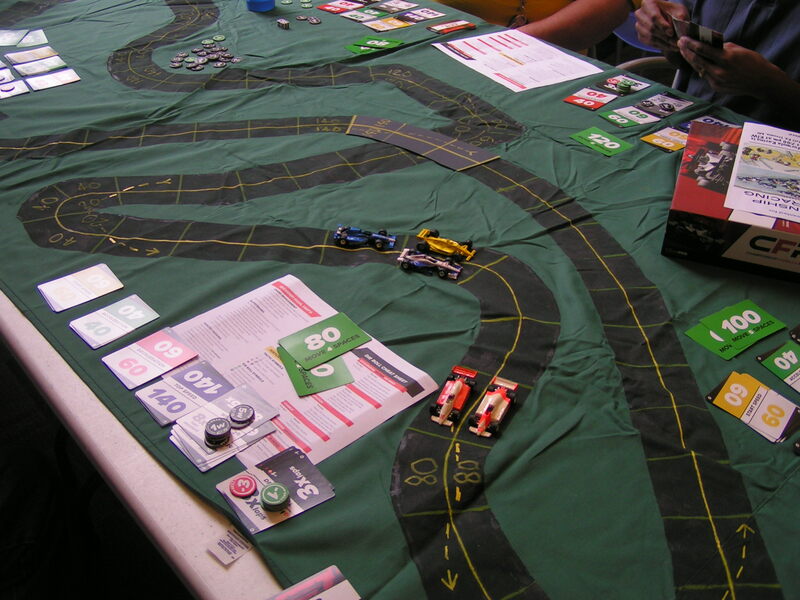 About that same time, I played USAC Auto Racing at local MDG game cons. I believe it was Don Walker who made a large scale Indy 500 track and used painted Mattel Hot Wheels cars. Don stopped running those events, so then I built a large scale Indy 500 track and bought and painted some Hot Wheels cars, and ran USAC Auto Racing at cons a couple of more times. 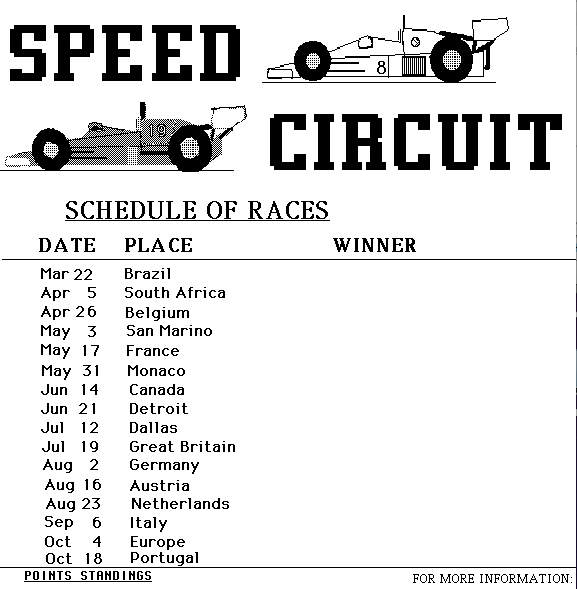 Speed Circuit flyer from 1985. A number of other guys then contacted me, and after having another demo race, we started our 15-race season on March 16, 1984, racing the Brazilian Grand Prix around the Jacarepagua track. Tom Kane took the first pole position, and was leading the entire race, only to have Tony Ploucha pass him at the last corner, and then Tony won the race! I managed to finish 3rd after qualifying 11th (out of 13 racers), mostly due to retirements of other drivers. That first Speed Circuit season in 1984 was won by Ray Eifler with 67 points (we used the 9-6-4-3-2-1 scoring system at that time). Richard White was 2nd with 62 points for the season, and Steve Zack was 3rd with 35 points. Race winners were Ray Eifler (5 victories), Richard White (2 victories), Andy Balent, Mark Hesskamp, Tom Kane, Tony Ploucha, Jim Robinson, Jeff Schwartz, Don Woodward, and Steve Zack. I managed to finish in 9th place with 19 points. We had a total of 26 different drivers during that season, and we averaged 12.8 drivers per race. The most drivers at a race was 17, at both Italy and Brands Hatch, and the fewest was 8, at Detroit. At that time, we were using the various Avalon Hill Accessory Pack tracks, in standard board-game size. We were also using the plastic cars from USAC Auto Racing that I had painted like the real Formula One cars of the mid-1980s. Avalon Hill’s Silverstone, England, track from Accessory Pack I. Playing Speed Circuit on the 1983-1988 version of the downtown Detroit Grand Prix track. Avalon Hill had a Detroit Grand Prix track you could buy, but it was of the 1982 course that had the hairpin turn at East Jefferson going into Chrysler Drive. The west end of the track wasn’t totally accurate, either, for either 1982 or for years 1983-1988. I got data for tracks from Road & Track magazine, but then I started buying the Autocourse books, which had much more detail about the races. It was also evident that playing on small tracks made it hard for everyone to sit around the table and be able to see which of the miniscule cars was theirs. So, we started making large-scale tracks on bedsheets, using 1:64 scale Hot Wheels cars. Richard White made most of the large tracks, and also made most of the cars. I helped cut off a few sidepods and wings, but Richard did a magnificent job of molding new sidepods, engine cowlings, and made new wings. He then painted the cars to look like the real Formula One Ferraris, McLarens, etc. Richard even painted the driver’s helmets to look like the helmets of the real-life drivers. This was back in the era when you couldn’t buy “collectible” cars that were molded and painted like the real cars. So then we eventually started playing on the large-scale tracks, with the larger cars, and it was much easier to have a large number of folks sit around the table and see the track and where their car was on the track. Large scale Suzuka, Japan, track. Alas, I can’t find any pictures of our old Speed Circuit races using the large tracks, so the above picture is of one of the large-scale tracks that was made in our Speed Circuit days. We are using that track with Championship Formula Racing, though. You can see some of the CFR driver and speed cards on the table. I exchanged some emails with the creator of CFR, Douglas Schulz, and he said he was given a copy of some “advanced” Speed Circuit rules from someone in the Baltimore area in the late 1980s. 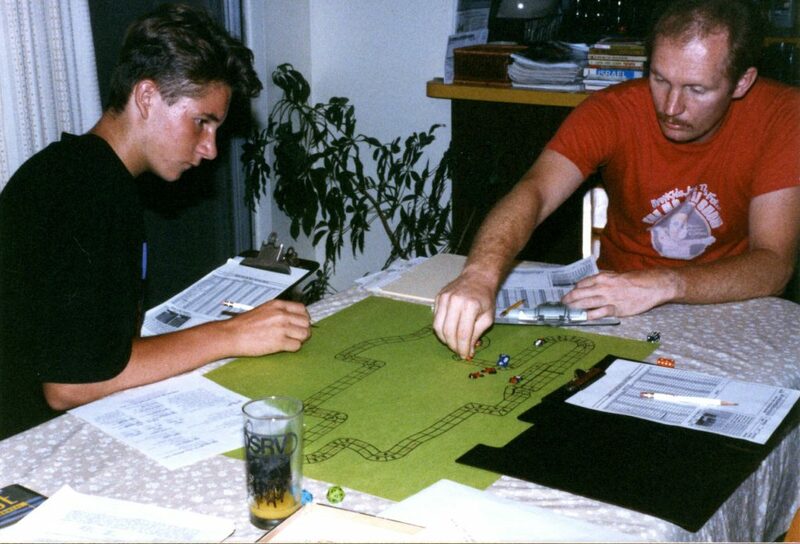 I believe they were a copy of our Detroit area ASC rules, as I had given copies to some folks in the Baltimore area when I attended an Origins game con there in the late-1980s. There are a few differences between ASC and CFR. 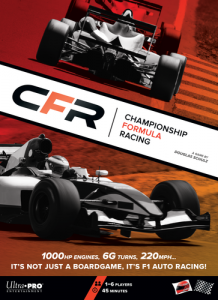 For one thing, CFR uses a simplified qualifying procedure where you “bid” some of your Wear and Skill markers; the higher bidders starting in front of the lower bidders. Also, we had used an attribute called “-2 DRM” and CFR uses “Skill” markers, where you can pre-designate using Skill to modify dice rolls. In our ASC days, we had actual qualifying sessions that were somewhat time consuming, but ensured that the better (or luckier!) drivers would start in the front. CFR also uses different (optional) rules for pit stops than we did. In CFR, you just move your car off the track and into the pits, whereas in ASC you had to drive down pit lane and into your numbered pit stall. Probably the most interesting rule in CFR are the hard tires/soft tires rule (which is used with the optional pit stops). If using the pit stop rules, your car will only start with about 40% to 60% of the Wear it would have received if you weren’t using the pit stop rules. If you are on hard tires, your car will regain a few Wear every time it completes a lap. But the coolest thing (for us maniac drivers) are the soft tires. Soft tires will enable you to use Wear for some things that you would have had to roll dice for. In particular, if you are on soft tires and are 60 mph over the speed limit in a corner, you can use 3 Wears instead of having to use 2 Wears and roll a Chance (to see if you might spin out or crash). Doug has also designed a number of tracks, especially newer tracks that didn’t exist in Speed Circuit’s heyday, and they are available as 8.5″ x 11″ printouts (downloadable from the Lucid Phoenix web page). 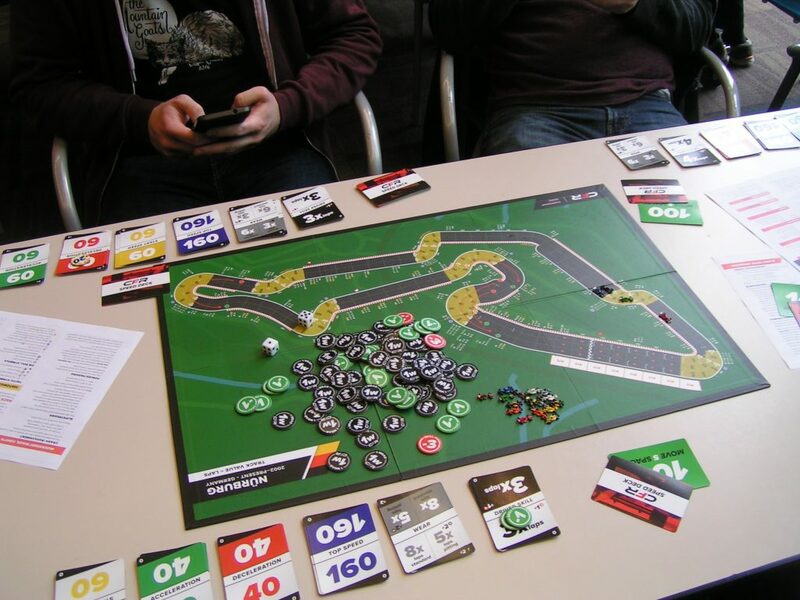 I believe that Doug has given too many tracks “three-wide” sections of track (and the Monte Carlo track that comes with the board game of CFR is way overly simplified), but all-in-all, Doug has produced a lot of good stuff for folks who want to race cars in a table-top board game! I believe Doug’s philosophy is to produce playable games, whereas our dedicated ASC group were more into an accurate simulation of tracks. We have a web page for our new local races using the CFR rules. Anyone who wants to race with us in the Metro Detroit, Michigan area, is welcome to attend our races. We have a demo race on Friday, June 9th, 2017, at 7:00 pm, at RIW Hobbies & Games in Livonia, Michigan. We plan on having races in several different game stores in the metro Detroit area, to even out the traveling miles and times for folks. This is so west-siders won’t always have to drive to the east side of town, or vice versa. This entry was posted on Friday, June 9th, 2017 at 12:35 pm	and is filed under Board Games, Miniatures Games. You can follow any responses to this entry through the RSS 2.0 feed. Both comments and pings are currently closed.